Let me just say that it has been over a year since I did my last beer review. Have I not been drinking beer? Of course I’ve been drinking beer. Have I not sampled any new treasures/disappointments? Of course I’ve had surprisingly impressive drafts and dismal, forgettable pours. The truth is that I have relied on some of my tried and true session beers on nights where I forecast that consumption is going to reach a palate-obliterating point. Good, great and, indeed, the finest brews are meant for a virgin (for lack of a better term) palate. This past Friday my friend Jason was thoughtful enough to save me four generous ounces from a 16 oz. 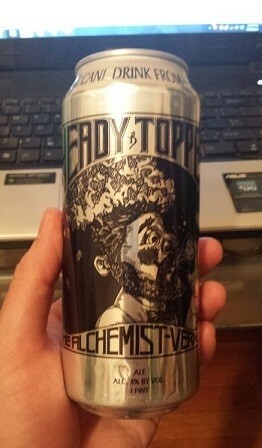 can of Beer Advocate’s most celebrated beer: The Alchemist’s Heady Topper. Disclaimer: I must also mention that this is the SHH, not Andy, the SHH beer reviewer with a refined palate to match his wit. I am the humble creator of this website who infrequently wrote reviews to add content to the website in its infancy. Do not expect wit or a comprehensive breakdown of this beer versus others in its class. I arrived at my friend’s apartment some minutes after the celebratory can was cracked and pours had been made. The can itself proclaims “Drink from the can!” My 4 oz. portion had already been poured into a pint glass which is the only reason that I have any idea as to the beer’s appearance. Heady Topper is golden but slightly cloudy with a half-inch, fluffy white head (hence the name I assume); it must have a decent retention (or the beer was poured in haste) as I’m told that I was about four minutes late to the tasting. The aroma was surprisingly strong considering that it had been poured some minutes before: obviously hoppy, but not slap-you-across-the-face hoppy, citrus, pine and a sweet fruitiness. Despite the fact that I didn’t drink from the can the beer had a most welcome taste that hung around. It’s complex: a balance of bitter hops and sweet & sour citrus with floral notes and a malty aftertaste. It’s certainly a step above most of the intentionally aggressive American Doubles. Unsurprisingly, given its reputation, I found the Heady Topper to be very, very drinkable. There was not a bit of astringency which at 8% ABV isn’t a miracle, but certainly an accomplishment. My only regret was that we hadn’t secured a couple of cans…I want to drink from the can! ← Happy 2nd Birthday, SHH!